Our ethical compass to realize results for our clients and their customers the ethical way – which, to us at Avanade, is the only way. The Avanade Code of Business Ethics describes and reinforces conduct that is based on our guiding core values, consistent with our policies and practices, and essential to Avanade’s legal and regulatory compliance obligations. 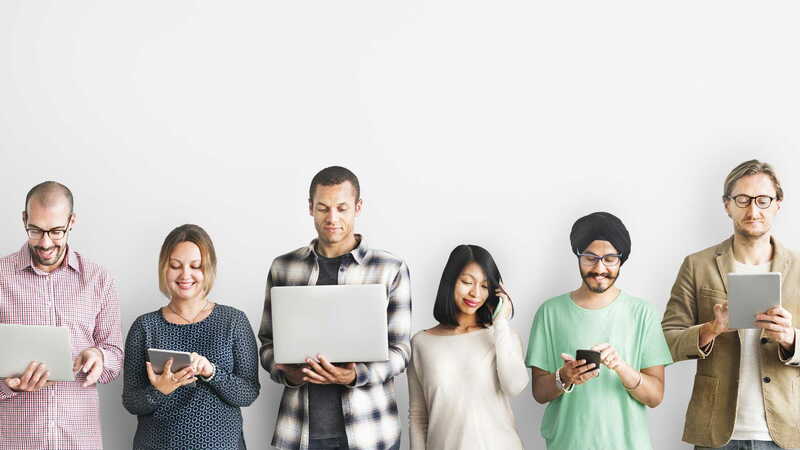 In a digital world, where rules are being defined as people go along, Avanade clients can count on Avanade and its people to protect their data with individual and specific plans. Employees can count on Avanade and each other to provide a safe and supportive environment where they are treated fairly and with respect. Alliance partners, including our parent companies, Accenture and Microsoft, can count on Avanade to be a leading digital innovator with a strong reputation for trustworthiness. The Avanade Code of Business Ethics (CoBE) is the compass that guides each of Avanade’s employees and contractors to live Avanade’s corporate values fully, to uphold company policies and to adhere to legal requirements. The CoBE sets clear expectations of what it means to innovate at Avanade, provides specific examples and points to helpful resources. The Avanade CoBE helps us realize results for our clients and their customers the ethical way – which, to us at Avanade, is the only way. Moving forward without leaving behind our most treasured rights. Realizing Results Ethically in a Digital World. The Avanade Board of Directors has established the Ethics and Compliance program, which is directed by leaders from across the business who serve on the Ethics and Compliance Council. Avanade’s Chief Executive Officer chairs the Ethics and Compliance Council and reports regularly to Avanade’s Audit Committee and the Board of Directors. Avanade‘s General Counsel oversees the Avanade Legal Group that runs the day-to-day activities of the Ethics and Compliance program. Avanade’s Ethics and Compliance team offers training, counsel, investigation support and management for a variety of ethics and compliance-related issues. You have several options for reporting a possible violation of the Avanade Code of Business Ethics or any good faith claim about Avanade’s financial affairs. This includes accounting practices, internal accounting controls, auditing matters, corruption or fraud, or other serious matters where the vital interest of Avanade or the moral or physical integrity of Avanade people is at stake. While callers can remain anonymous, Avanade asks for contact details to be able to request additional information to resolve some cases. 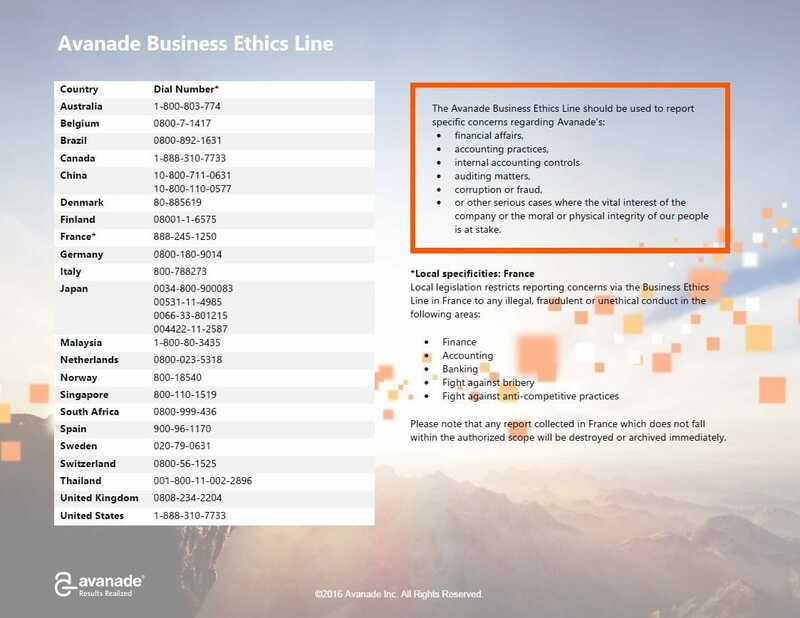 The reporting scope and/or anonymity requirement of the Avanade Business Ethics Line may be restricted in some countries, as described on the Avanade Business Ethics Line website. Call the Avanade Business Ethics Hotline (you can reverse the charges). Select your local number below. We like to help. Not just our clients, but also the people and places where we live and work.